Evil just isn't what it was. Used to be, you could slaughter a dwarf and gnaw his gnarly bones all the way home without attracting any undesirable attention. Now? Not so much. It's a new world, you know? And it might just be that the new world needs a new breed of evil. In The Good, the Bad and the Smug, Tom Holt—aka K. J. Parker—proposes exactly that as the premise of a satirical and sublimely self-aware fairytale that brings together the wit and the wickedness of the author's alter ego with the wordplay and the whimsy which have made the YouSpace series such a sweet treat so far. It isn't all he has to offer either, for Mordak is also the face of New Evil: a "caring and compassionate" (p.281) agenda he's in the middle of forcing down folks' throats when his eternal enemies—is there anything worse than people, really?—suddenly find themselves filthy rich. So filthy rich, in fact, that they could cause a proper problem for the goblins. This is an obstacle Mordak simply must overcome if he's to have a chance of realising his reforms. To wit, together with Efluviel, an elf who'd do almost anything to get her job as a journalist back—a job Mordak can give her as easily as he took it away in the first place—the King strikes out on an unexpected journey in order to expose the source of all the goddamn gold the humans have gotten their grubby paws on. "Anyhow, on the whole it all sorts itself out, and so long as the balance isn't interfered with, everything chugs quietly along and nothing suddenly breaks down or goes horribly wrong," (p.197) but the sudden influx of money has knocked the situation for six... which may go some way towards explaining why Mordak has been behaving so strangely of late. The thing is, his New Evil agenda bears a certain resemblance to heroism. Sometimes he even saves the day! Equal parts Terry Pratchett, Jasper Fforde and, naturally, K. J. Parker—the similarities are difficult to miss now we know they're there, especially in the intentionally tortured sentence structure—Tom Holt's new novel is, like his last three at least, a bona fide feast of fun. Composed as it is of courses of social commentary, observational comedy and subversive satire, each as smart and sharp as the last, The Good, the Bad and the Smug is a metaphorical meal worth munching... albeit one best digested in bite-sized sittings. To be sure, you could easily read it in an evening, but the fourth of the loosely-connected YouSpace books tells a tale you should savour rather than gorge on, lest its lacks—characters that aren't a patch on Pratchett's, and great swathes of story that seem to be going nowhere slowly—become apparent. But take your time and you'll find a whole lot to like, most notably an extended riff on Rumplestiltzkin with a real fiscal cliff of a twist. 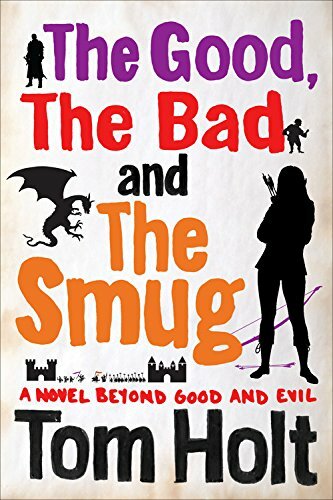 A word to the wise: The Good, the Bad and the Smug probably isn't the best jumping-on point for K. J. Parker fans keen to experience the lighter side of said pseudonym. Read Doughnut instead; When It's A Jar when you're ready; and then there's The Outsorcerer's Apprentice. I dare say you'll find your way back to The Good, the Bad and the Smug sooner rather than later, because once you start reading Tom Holt, there's not much in the Multiverse that could cause you to stop.